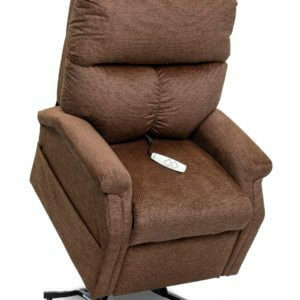 The Infinity Collection from Pride® Power Lift Recliners delivers the best in comfort, style and performance. Find that perfect position with true infinite-position seating. Pocketed coils provide individualized support and maximum relaxation. The Infinity Collection from Pride® Power Lift Recliners delivers the best in comfort, style and performance. Find that perfect position with true infinite-position seating. Pocketed coils provide individualized support and maximum relaxation. The Infinity Collection comes standard with a lumbar pillow and head and arm covers. Large dual pockets provide ample storage space, while the easy-to-use hand control features a USB charger port, so you can charge your smart devices. Choose from a variety of fabrics and colors to make the Infinity Collection uniquely yours. Please download the Infinity Collection Brochure here for color swatches.